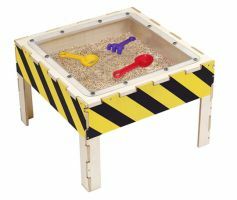 The Construction Sand Play Table is immediately identifiable as a hard-core play area by the caution tape wrapped around the sides. Complete with construction tools, this table will impress any hands-on child who appreciates getting busy and dirty! This is a great toy for kids who like to dig and explore. Ages 3+.